This is the official list, so it can’t be wrong, right? We’re taught from an early age not to talk about politics or religion in mixed company. It’s touchy, sensitive, and rarely ends well. However, if you’ve never brought up the topic of Halloween candy in front of very passionate people, it’s time you did. The result will be what I assume pyromaniacs appreciate about setting blazes: uncontrollable burn! Earlier this week, I asked my friends and family, and Facebook followers to answer one simple question: What is the worst Halloween candy? It turns out, people can get heated when bashing or defending candy—and how! Inevitably, someone actually likes the one five people think is garbage, and one person then rides in to trash a beloved favorite, only to stir the quieted masses from their slumber. The folks at CandyStore.com have finalized their list of the worst Halloween candies, and since they happen to be in the business of sweets and sugary things, I’d bet they know a little bit about which candies fly off the shelves and what collects dust. Here, their definitive rankings of the worst candies you could possibly hand out at Halloween. Or, to put it another way, avoid giving these to visiting ghosts and goblins unless you want your house toilet papered while you sleep off your sugar coma. To be honest, I confuse Mary Janes with Bit-O-Honey. These hard-as-a-rock peanut butter taffies are a relic of Halloweens gone by. The petite rectangle taffy pieces are wrapped in a yellow and red paper with a pencil sketch of a little girl. Mary Janes may be a candy of the past soon. They’re made by Necco, the same folks who make Valentine’s famous Conversation Hearts, and they shuttered their doors earlier this year. I’ve yet to meet anyone who likes black licorice. Anise? Okay, maybe in a soup. But black licorice? No, thank you. To think, people used to save their pennies for pieces of this candy back in the day. They need a refund. At this point in the list, I’m losing hope for humanity. Tootsie Rolls come in the traditional chocolate variety, and at Halloween, you can find the flavored options, too. They’re waxy and overly chewy, yes. They also taste only tangentially like the flavors they’re intended to resemble. But if you like that tooth-pulling chewy sensation, these can’t be beat. Universally hated, loathed even, these taffy-like Peanut Butter Kisses are famous for their orange and black waxy paper—and that’s about all they have going for them. They’re cute because they sport Halloween colors, so use them as decoration. Just please don’t hand them out on Halloween night. Like Mary Janes, paper-thin chalky Necco Wafers may be gone soon, so enjoy hating them while you can. They’re essentially flattened Smarties, but chalkier, and somehow, with less flavor. I’ll go ahead and lump all wax candies into this category because they all belong on this stage of shame together. Wax and sweets don’t mix. Period. Edible waxed fangs, lips, and wax candy bottles aren’t cool or cute. They’re gross, with their tasteless outer coating and technicolor sugar syrups. And are they really edible, candy manufacturers? Or is it all one big waxy lie? 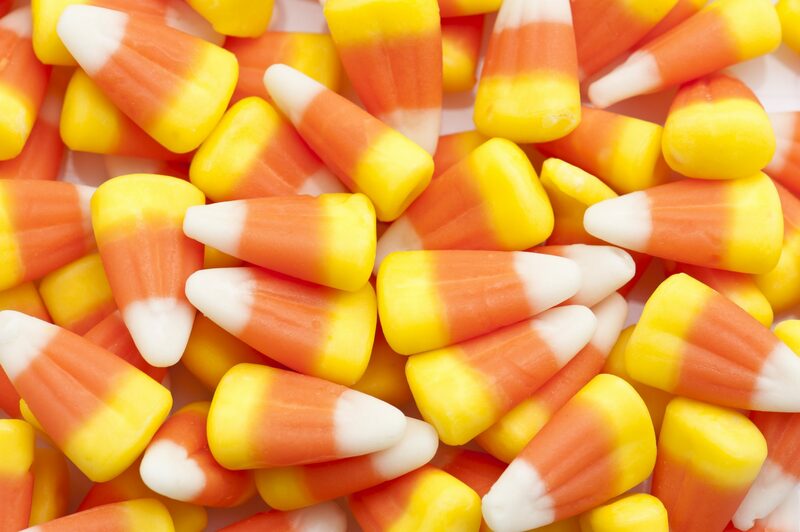 Oh, sweet candy corn. You thought you’d get off easy, didn’t you? You may be loved because you are the harbinger of Halloween, the precursor of pumpkins, the forerunner of fall and festivals and Frankenstein. Alas, you are perhaps loved for your looks—and that’s about it. Candy corn is nothing more than colored sugar paste, layered and cut into cute triangles. Does it hold a special place in our hearts? Sure. But also in our mouths because, y’all, it’s just sugar, and it’s going to rot your teeth. If you prefer your Nerf toys in edible fashion, have we got the candy for you. Coming in at number one, the worst of the worst, Circus Peanuts. Are they marshmallow? Or flavored foam? Are they orange? Or some vague representation of sweet with a slight hint of banana and—is that mango? It’s hard to know. And don’t bother trying them to find out. There are so many better candies to be had.